Julie Metz's life changes forever on one ordinary January afternoon when her husband, Henry, collapses on the kitchen floor and dies in her arms. Suddenly, this mother of a six-year-old is the young widow in a bucolic small town. And this is only the beginning. Seven months after Henry's death, just when Julie thinks she is emerging from the worst of it, comes the rest of it: She discovers that what had appeared to be the reality of her marriage was but a half-truth. Henry had hidden another life from her. "He loved you so much." That's what everyone keeps telling her. It's true that he loved Julie and their six-year-old daughter ebulliently and devotedly, but as she starts to pick up the pieces and rebuild her life without Henry in it, she learns that Henry had been unfaithful throughout their twelve years of marriage. The most damaging affair was ongoing--a tumultuous relationship that ended only with Henry's death. For Julie, the only thing to do was to get at the real truth--to strip away the veneer of "perfection" that was her life and confront each of the women beneath the veneer. 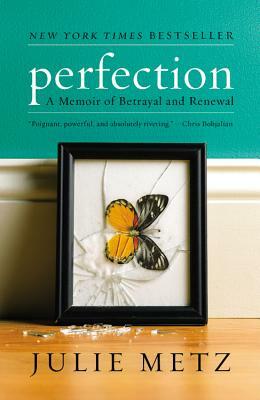 Perfection is the story of Julie Metz's journey through chaos and transformation as she creates a different life for herself and her young daughter. It is the story of coming to terms with painful truths, of rebuilding both a life and an identity after betrayal and widowhood. It is a story of rebirth and happiness--if not perfection.